I had ZERO interest in reading Big Magic since the last (and only) book I’ve read of Elizabeth Gilbert’s was Eat Pray Love and eight years later, I still haven’t gotten over how much I disliked that book. Then within a few days of each other, two of my favorite bloggers, Miranda and Emily, both posted independently about how incredible this book was. You guys! This book is incredible. You heard it here first (or last). I don’t self-identify as a creative, and a lot of the time, I feel like books about creative living totally miss the mark for me, but this book is more about making creativity, in whatever form that looks like for you, part of your life. She discusses early on a friend in her 40s who realized that the most alive she’d ever felt in her life was as a young teenager taking ice skating lessons. And so now, decades later, took it back up. She wasn’t trying to become a professional ice skater, she didn’t quit her job or divorce her husband or move across the world – she just started skating a few mornings a week before work and that brought a new sense of joy to her life. That kind of creativity? I can get behind. (But if you’re a maker of some sort or actually ARE a creative, there’s a lot in this book for you too). When Modern Mrs. Darcy mentioned it, she said she’d been warned that the book was “equal parts tough talk and woo-woo.” I was about half-way through the book when I read her post, and that description made me laugh out loud because it’s totally true. 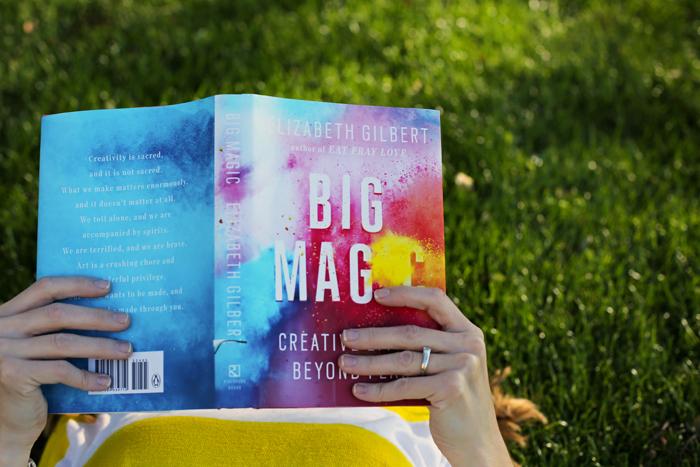 Of course, because Elizabeth Gilbert is a writer, a lot of her examples of creative living have to do with being a writer, but most of her themes are totally applicable to whatever kind of creative life you want to have. The book is over 250 pages, but it’s a totally easy and engaging read, almost like chatting with a friend for a few hours, and I loved every page of it (which, again, I kept looking up and thinking, “I can’t believe I’m loving this book by Elizabeth Gilbert so much”). Mainly, I loved her light-hearted approach to creativity. She totally rejects the idea that creativity has to be dark and painful – creating something should bring you joy, even if it’s hard work, and it definitely shouldn’t destroy your soul or your life or your relationships in the process. She had a great section where she talked about doing all the hard work between the amazing highs of wonderful creation and how that’s not an interruption. That hard work IS the process. I like that, even in Big Magic, as she terms it, there is just a whole lot of serious work that goes into making anything happen. It really was such a tremendously good book that I found incredibly inspiring – it was the perfect thing to read as the year wound down and I started thinking about what I want to do in the new year. It made me feel optimistic, light-hearted, and ready to put in the time to accomplish things that are meaningful to me. And it’s the kind of book where you’ll probably want to own your own copy, because there is so much good stuff to mark up as you read. If you’ve read it, I’d love to hear what you thought! Well, if I'm to be honest, I really DISliked it. I tried it for about twenty pages, and although I can get behind the general message and maybe even some of her concrete ideas, I could NOT get behind the writing. It seemed too . . . flip, maybe? When she used the word "like" in a sentence in the manner of a if she were 16-year-old, she lost me. I've seen a LOT about this book lately, especially in end of the year roundups. Sounds like a good one to check out! I'm just worried that if I read it I'm going to get so inspired but then not have the time to implement the changes I want to! I very much dislike the attitude that the only way to make your life matter is to disrupt it, and the only way to "find" yourself is to go on expensive jaunts to India and Italy (I hated Eat Pray Love too, as you can tell). (Related angst is about "doing what you love" because that is such a classist and also exploitative way to think about work.) I'm very relieved to hear that she understands that not all of us are "creative" and that that's fine. I put the book on my to-read list! The last time you and Emily both recommended a book (The Martian) I loved it! I guess this will have to get added to the list now too! If you haven't read her novel, The Signature of all Things, I'd strongly encourage you give it a shot! It generated one of the best book club discussions we had last year. As she admits in Big Magic, she never aimed to be a perfect or good writer, just a writer. I like that approach and I especially appreciate that she identifies and incorporates so called non-creatives. This post came at the right time. I have similar feelings about Eat Pray Love, but I keep hearing about this book. I just reserved it from the library this morning because my friend Jamie mentioned it again at lunch yesterday. I'm glad to hear you liked it. I'll be picking up the audiobook this weekend. I'm excited to start listening on Monday. I wasn't a super big fan of Eat Pray Love, but I did quite enjoy a few of her other novels (especially Stern Men, but I did like The Signature of All Things too, even though it was a little long). I'll have to add Big Magic to my TBR, and she's also got a related podcast called Magic Lessons that I downloaded after reading your review (the episode I listened to was pretty good too). Well I've seen similar reviews so many times now that I think I should give it a try. I've listed to the sample of the audio version and just wasn't hooked at all. But I started reading your blog just recently and I've noticed you tend to be utterly honest. Thank you! So when you say it's tremendously good, I believe you. Will pick it back up soon. I'm going to add this to my list! I never finished Eat, Pray, Love because I found it so dull. I am half-way through Big Magic and I love it. Mostly because it inspires me to do something besides my normal everyday stuff.